My Craft Evolution: Yikes! Look at all those crayons. Yikes! Look at all those crayons. It was a busy day at my house. 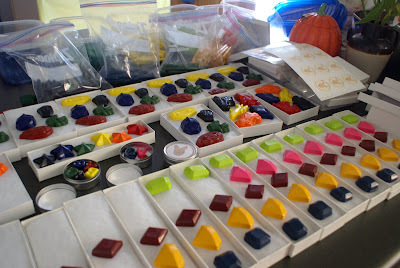 My Jewel Crayon Set was featured on Etsy Finds: fun to grow on. Lucky for me it was a Tuesday when I have extra time for my shop. The orders came pouring in. 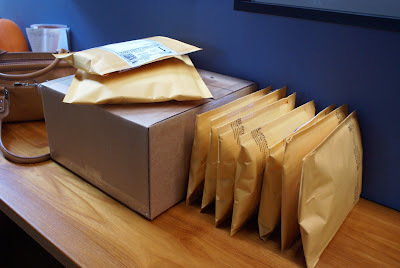 At the end of the day I ended up taking 10 packages to the post office with a few more waiting for payment. It was pretty exciting but I couldn't help but notice that my supplies are dwindling. I even emptied my big box of boxes. I thought I'd never see the bottom of those 100 long boxes. 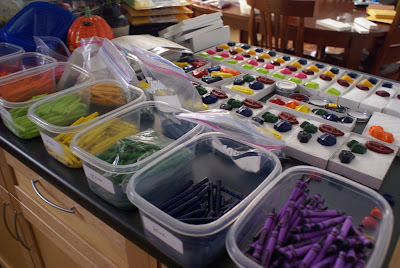 Now I need to decide if I reorder my supplies or begin to transition to different items. It makes me a little sad to let something so successful go but I love a creativity challenge. I saw that this morning! congrats. I'm glad you were featured. I meant to email you to make sure you saw...but the day got away from me.